In a surface area of 10,000 m², the new medication warehouse of Geolab in the DAIA industrial complex (agro-industrial district of Anápolis, in Brazil) has a capacity for more than 12,000 pallets. In this distribution centre, 150 daily orders are prepared in a race against the clock to supply all its customers spread around the country. Founded in 1999, Geolab is a pharmaceutical company whose headquarters is based in Anápolis (in the country’s centre). It produces, mainly, generic medications in different formats (vials, pills, capsules, powder packets, etc.) that are sold in all Brazilian states. Despite being such a young company, it has always maintained a steady growth rate and, currently, employs more than 1,200 workers and carries product portfolio of more than 200 types of medicines. The agro-industrial district of Anápolis (Brazil), better known as DAIA, is one of the largest industrial complexes and logistics centres in all of Latin America. It fills an impressive stretch of terrain of 593 hectors. Since its opening in 1976, industrial business sectors have coexisted here in as varied industries as pharmaceuticals, chemicals, textiles or automotive. The manufacturing centres that house them operate 24 hours a day. Part of DAIA’s success is due to its strategic location in an important transportation hub, close to highways and the Anápolis International Airport, as well as the government tax incentives for industries that set up throughout the Goiás State. In conjunction with Geolab, 20 other pharmaceutical companies are located in DAIA that, together, produce approximately 16 billion medications annually. Since the 80s until today, these companies have experienced unprecedented increases in sales as a result of the rising consumption of generic medicines in Brazil. Agility is often one of the top priorities in any warehouse, independent of the business sector it is run by. However, in the pharmaceuticals sector, this takes on a unique edge by having direct repercussions on the health of people. Speed is the key to stocking pharmacies on time and so that customers can get medications exactly when they need them. Another priority in this sector is to ensure the security of the merchandise, i.e., that medicines are kept in optimal conditions so that they stay effective enough. For this very reason, control over pallets represents one of Geolab’s needs in its new warehousing installation. Recently, Geolab has opened a 10,000 m2 warehouse next to its production centre, just 500 m away. The installation is allocated for storing finished products, ready to be distributed to its customers. 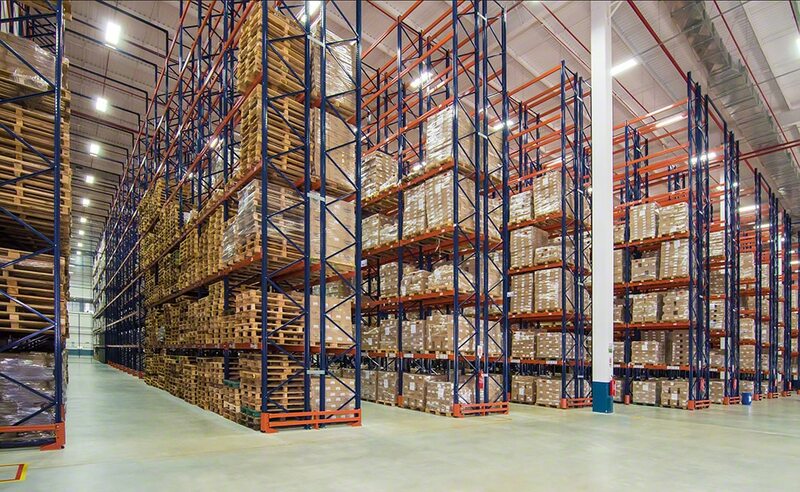 Mecalux has equipped this warehouse with pallet racks. One of the advantages of this solution is that direct access to products delivers the potential for high-speed picking and storage work. Racks are 15 m high, with eight shelf levels, and are 60 m long. Due to the huge dimensions of these racks, the goods were distributed on the shelves according to their rotation. The warehouse is sectored to group similar-featured products together into the same area (dietary, cosmetics, returns, promo material, etc.). The products with a lower demand level (since they are requested less frequently), are deposited on upper shelving levels. On the other hand, consumer products are housed on lower levels, so they are within easy reach. When it is time to insert or extract pallets from their locations, the operators make use of forklifts and also stackers (the latter, for the first and second levels only). In the reception zone, they receive an average of 150 pallets a day in lorries arriving from the production centre. Once the appropriate inbound controls are done, the SKUs are stored, either in the pallet racking or in the live storage for picking. Each day they put together around 150 orders (with spikes of up to 250), comprised of 300 order lines each. This operation takes place, chiefly, in the lower levels of the racking for orders requesting full boxes. Operators move towards the locations listed by the warehouse management system (WMS) and, at the same time, pick needed boxes and set them on a pallet that moves around on a pallet truck, and where SKUs that comprise the order are grouped. Using a WMS to organise all operations prevents errors from being made. In one of the warehouse zones, live storage for picking was installed and set aside for small-sized products. These comprise slightly inclined roller tracks, meaning boxes slide forward through gravity. These racks can house up to a maximum of 5 boxes. Operators pick listed items directly from inside the boxes. One advantage of this solution is that reserve product is kept on the same level, behind the first box, which means the needed product is always accessible. Finished orders, ready to be shipped out of the warehouse, are grouped in the preloads zone, right in front of the docks, awaiting the arrival of delivery vehicles. Every day, close to 200 pallets leave this distribution centre. Each dock is separated via metallic partitions so that only authorised workers can gain access to these zones. Maximum storage capacity: the racks offer a storage capacity for 12,360 pallets of finished products to be distributed. Security as a priority: the distribution of the goods as per their features and demand, as well as the use of metal enclosures, ensure medications keep their medicinal qualities. Agility in all operations: direct access to pallets eases the preparation of 150 orders a day and helps to render fast, efficient customer care.